Desert Hills 4 is a 55+ community in Green Valley, Arizona. This neighborhood of attached homes includes access to Green Valley Recreation s envious lineup of amenities scattered throughout Green Valley. 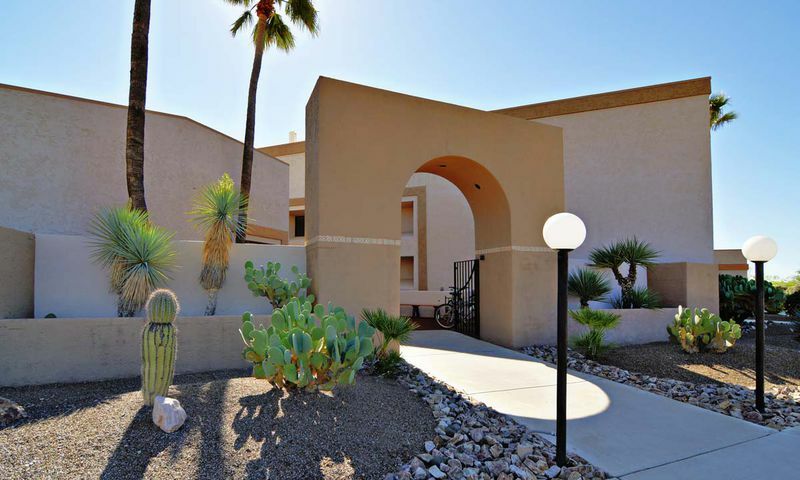 One of the many recreational facilities is located just across the street from Desert Hills 4. Green Valley is a Baby Boomer's paradise where the majority of subdivisions are dedicated to active adult homebuyers. Desert Hills 4 offers resale ranch townhomes that include main level living and low-maintenance exteriors. Green Valley Recreation (GVR) is an organization that serves the physical and social needs of age-restricted households throughout Green Valley. Desert Hills 4 shares GVR s 13 recreation centers with many other active adults. Throughout these amenity-filled facilities one will find fitness centers, craft studios, meeting rooms, multi-purpose rooms, restaurants, ballrooms, hobby rooms, computer labs and more. Homeowners within Desert Hills 4 also have access to all of the amazing outdoor amenities provided by GVR. This includes 13 heated swimming pools, 17 tennis courts, 52 shuffleboard courts, pickleball courts, bocce ball courts, a basketball court and volleyball court. Residents can also take advantage of Southern Arizona's climate by utilizing the miles of trails and picnic areas that have picturesque views of the Santa Rita Mountains. Desert Hills 4 is an established 55+ subdivision in Green Valley that contains 224 homes. All homes are ranch townhomes developed by Fairfield Homes between 1984 and 1988. Active adult homebuyers can find a reasonably priced resale home in Desert Hills 4 that has about 1,000 to 1,200 square feet of living space. Most of these attached residences were built with two bedrooms, two bathrooms, and an attached garage. Homeowners appreciate the low-maintenance exteriors and main-level living. GVR s host of restaurants, ballrooms, theaters, and meeting rooms provide entertainment opportunities nearly any night of the week. You ll often find homeowners gathered to play games of bridge, bingo, poker, euchre, hearts, and more. Those looking for a bit of athletic competition will enjoy playing tennis, shuffleboard and racquetball. Whether joining the arts and crafts association or attending a pancake breakfast, there are endless ways to socialize and find new hobbies. Desert Hills 4 in Green Valley is located in Pima County, Arizona. This location in Southern Arizona enjoys a year-round warm climate and easy access to entertainement. Desert Hills 4 is just 16 minutes south of Sahuarita and less than 40 minutes south of Tucson. When traveling even farther is necessary, Tucson International Airport is just a 30-minute drive north. Desert Hills 4 is a wonderful option for active adults looking to retire in an area designed for 55+ homebuyers. There are plenty of activities available in Desert Hills 4. Here is a sample of some of the clubs, activities and classes offered here. Desert Hills 4 consists of 224 attached residences built by Fairfield Homes in the 1980s. These homes have between approximlaty 1,000 to 1,200 square feet of living space. The majority of homes in Desert Hills 4 have two bedrooms, two bathrooms, and an attached garage. Please Note: Floor plans are not available at this time. So many of the Green Valley neighborhoods look the same, it was kind of hard for me to finally make a decision. I'm happy with my house and I like having one of the rec centers so close, it's close enough to walk for me. I really liked the views and the traditional look of the homes here, it just seemed a little nicer than some of the others and the price was great when I bought two years ago! 55places.com is not affiliated with the developer(s) or homeowners association of Desert Hills 4. The information you submit is distributed to a 55places.com Partner Agent, who is a licensed real estate agent. The information regarding Desert Hills 4 has not been verified or approved by the developer or homeowners association. Please verify all information prior to purchasing. 55places.com is not responsible for any errors regarding the information displayed on this website.